The new iOS 11 has a lot of amazing features which you won’t find in any previous iOS version and even in any other OS. Whether we talk about system improvements or we consider the availability of different system features like mapping and searching on the device, everything is perfect on iOS 11. Just after its release, there were thousands and millions of people on the social media and the internet talking about its features and accessibility. Now when we have this iOS version, we will only talk about its cool features for any of your iPhone. However, the new iOS 11 is not that great. Most of the times, people talk about the new features of Apple adds in the latest iOS release. But today we will teach you how to turn off Auto Brightness feature on your iPhone and iPad running iOS 11. 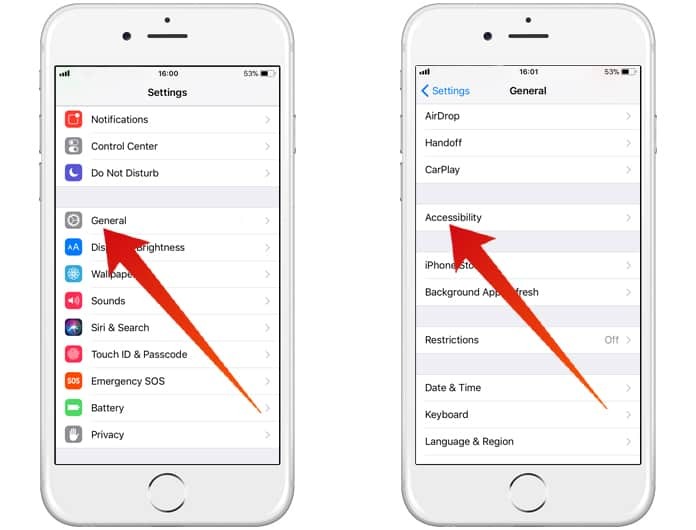 The new iOS 11 has some problems with its accessibility features. A lot of people have reported of different things, and the most popular is auto brightness feature. In iOS 11, the auto brightness service is no more in the Display & Brightness option under Settings app. In the previous versions of iOS 11, this was an easy task. All you need was going to the Settings app and going to Display & Brightness option. Now the Auto Brightness button has been removed from there, and people are wondering about how to turn this feature on or off. 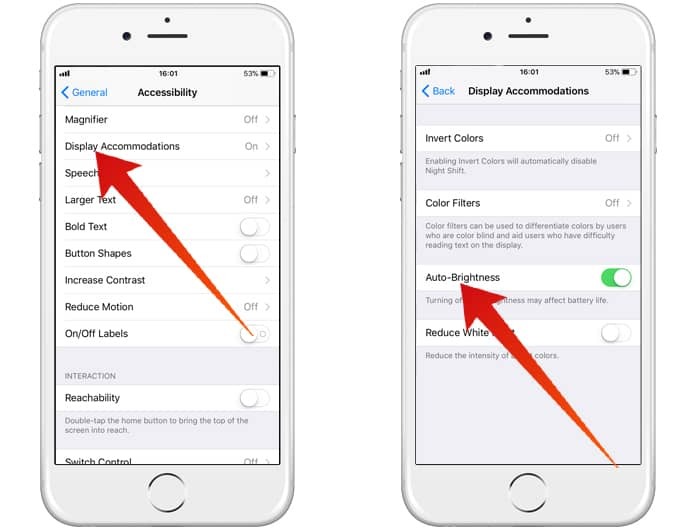 The auto brightness feature is turned on by default, and you can turn it off whenever you want. Although it is a cool feature, it drains battery life faster. That’s why most of the people turn this feature off on their iPhone. Now if you want to turn this feature off on your iPhone, what would you do? 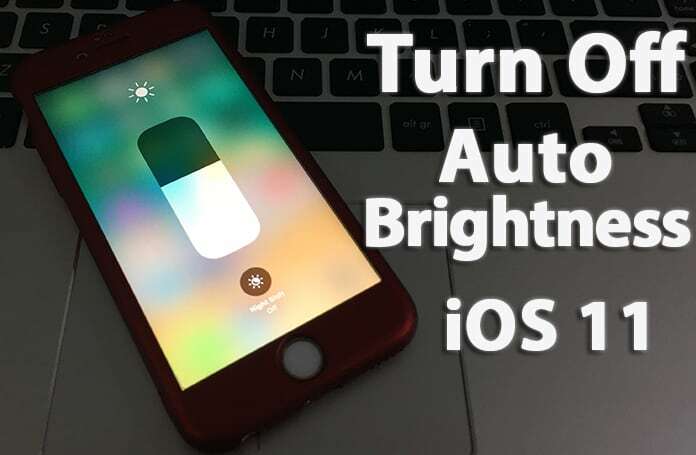 Today we will tell you how you can quickly turn off or on Auto Brightness feature on your iOS 11 device. Step 1: Go to the Settings app on your iPhone and click on the General option. Step 2: Here you will see an option named Accessibility, click on it. Step 3: Now click on Display Accommodations. Here you will see the Auto Brightness toggle switch. You can turn it off or on through here. Once you turn this feature off, your iPhone will keep using the brightness level as adjusted by you. This is a strict method as compared to the method in the previous version of iOS 11. However, you can easily get through this by following the process mentioned above.